Offering you a complete choice of products which include pcb drilling and routing machine. 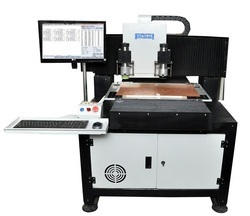 PCB Drilling and Routing Machine offered comes in the precision engineered finish and with high performance USB Interface. Programming in code standard. Other modes optional. PCB drilling and routing machine support to open OrCAD & Protel software file for drilling and routing. Plt, Basic Dxf file support for PCB Routing. PCB drilling and routing machine software supports programming facility from existing job. Very good strength for PCB routing. Auto vacuum suction for chip removal. Step and repeat for multi-posting . Simulation facility for PCB drilling and Routing. Industries, laboratories and educational institutes. PCB drilling and routing machine software supports Pattern edit facility.